“YERT – Your Environmental Road Trip” is an entire environmental film festival wrapped up in an absorbing and entertaining, fast-paced two-hour documentary that’s both personal and planetary. Friends Mark, Julie and Ben pack themselves into a Prius to tour all 50 states in 52 weeks while aiming for near-zero garbage.We view environmental problems like Appalachian mountaintop removal, Alaska permafrost melt, and post-Katrina wetlands habitat destruction, southwest water depletion. 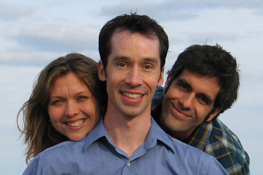 We meet problem-solvers like Wes Jackson restoring perennial prairie grasses, farmer Joel Salatin cycling animals through pasture to build soil, and Will Allen growing plants and fish to feed the city. We meet creative people building houses inside caves, turning compost into worm poop then packaged in recycled plastic, and developing solar panels roadways to replace asphalt in the post-petroleum era. These twenty-somethings intersperse a lot of playfulness amidst the serious talk and fascinating tours. Silly, funny, gross, wacky. Ben pushes the Prius down the road on “National Bike and Walk Day.” In their five-day Iowa Corn Challenge, Mark chows down only fresh corn while Ben scarfs packaged foods containing corn products (all that high-fructose corn syrup, yuck!). The trio lets us glimpse real life on the road, up close and personal: moments of elation, crabbiness, joy. Julie discovers she’s pregnant early on and bails from the vegetarian diet. I won’t spoil the ending, but you’ll find out whether it’s a girl or boy, and just how much garbage the trio accumulated. This well-produced overview of important environmental issues and sampler of creative responses is optimistic without being pollyanna. We loved it. Smiles amid the serious stuff and the inspiring innovators. A chance to meet some of our heros and watch young people learn lots. We hope to follow in their footsteps and bring Peak Moment TV viewers longer chats with many of YERT’s interviewees. 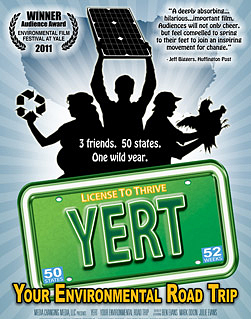 With five film festival awards (and counting), YERT is an inspiring one-movie environmental film festival for EveryTown. Go to yert.com to watch the trailer and other clips, buy a DVD, find a screening, sign up for their e-mail list. Watch a short video with Mark and Ben at TEDx with innovations featured in their film. Its really encouraging to find and know of others making their own sites and how they are doing .I am growing my whole lot in garden this year. It was a small one the last couple of years . Now I’m unemployed auto mechanic at 60 years old. I know how much pollution comes out of these cars so I’m fixing and doing hydrogen supplement and setting E 85 on these . I have home made solar to grid and complete made solar panel. The aray just puts out 150 most of the time but thats working for two year. I plan the whole house in a couple of years. Slowly as I add more and more. Out in my Garage I have 6 batterys useing solar to 750 watt at least I can use as lights and some power tools. I have hydrophonics,and working on aquaphonics. worm bin for good compost and ground compost. I want to prove to all we can live normal with out costing more out of pocket.